An unexpected assessment of a recent (invited) clash of opinion in the Wall Street Journal. Albert Mohler, president of the Southern Baptist Theological Seminary, clearly realises the difference between someone who uses language to explicate, and someone who uses it to obfuscate. "Dr Williams issued a rare joint statement with the Chief Rabbi, Sir Jonathan Sacks, and the Archbishop of Westminster, the Most Rev Vincent Nichols, stating their opposition to any change in the law on assisted suicide before Lord Falconer’s failed amendment. They spoke of their fears that vulnerable people would feel under pressure to end their lives and relieve the burden on family if assisted suicide were decriminalised." It seems to me that these religious leaders aren't against assisted suicide because of some pious concern about putting the vulnerable elderly under pressure - they're against it because suicide is a "sin". Are there different kinds of truth? As with a lot of discussion, it helps if the participants are using terms in the same way. The reaction to M+K's accommodationist tome has been overwhelmingly negative (among those whose opinions I value). More plain speaking from Greta Christina - which is particularly appropriate given that this is a critique of Karen Armstrong, who's writing appears to be deliberately geared to impede communication rather than facilitate it. Jerry Coyne cuts through the mush. Once more I'm reminded why I'm on the side of Coyne, PZ Myers and Richard Dawkins regarding "accommodationism". Is it worth arguing with theologians? Over at Daylight Atheism there's a discussion about original sin. This is one of those fascinatingly odd ideas of Christianity that defies logic, though it's endlessly debated by earnestly learned theologians. I piped up in the comments to the effect that I didn't see the point of the discussion, and was roundly rebutted. Such debates can be interesting in a "let's see how far we can get with this puzzle" kind of way, but I don't see how they could sway those taking part. People who are prepared to argue at length about these issues are probably already fairly entrenched in their views. Maybe the idea is to say something like "OK, let's for the sake of argument assume that God exists, and explore the ramifications of that assumption." But in what way is pointing out the logical inconsistencies of those ramifications likely to lead theists to question the initial assumption? Let's assume for the sake of argument that there are fairies at the bottom of my garden. What is the point of discussing what they eat in the winter or how long it takes to dry off the dew from their wings in the morning before they are able to fly? Can you really have a useful discussion with someone who believes they have rational answers to such questions? My fear is that by conceding the initial assumption, albeit temporarily, we also concede the legitimacy of the subsequent arguments, when such legitimacy is clearly unwarranted. I'm an equal-opportunity sceptic. My stance is that we should deal even-handedly with creationists, alt-med proponents, psychics ... and theologians. It was pointed out to me, however, that though the participants of such discussions are unlikely to be persuaded from their respective positions, it is likely that there are others observing the discussion, and therefore it's useful to pursue the arguments for the simple reason that many agnostics - and even firm believers - have come to doubt their previously unchallenged beliefs by hearing them questioned. This fits with my established opinion that religious fundamentalists (creationists, for example) should be publicly challenged because it alerts the religious moderates that nonsense is being promulgated in their name. So in response to the question posed in the title of this post, I hereby revise my answer to "yes". But he misses the point. The internet is not something wholly different and "evil", it is merely an extension of previous media and means of communication. As host of The Rev Up Review podcast I contacted many people in the United States by email, instant messaging and Skype - people I am unlikely to have contacted otherwise. They would have been effectively out of my reach here in Portsmouth, UK. Were these relationships of any less value that face-to-face ones? Perhaps. But in 2007 I flew across the Atlantic to attend a convention, and I met them in person, face-to-face. So these particular "internet" relationships are now exactly equivalent to "real life" relationships. Without the internet, however, they would almost certainly never have existed. Creationists generally seem to be ignorant, deluded or disingenuous. Here's one who is deeply sinister. PZ Myers muses on Karen Armstrong versus Richard Dawkins, and comes out with this great quote: "Science gets the job done, while religion makes excuses." I hear PZ is writing a book; let's hope we don't have to wait too long for it. "Its [sic] a world of complexity beyond my ability to follow, with many highly complicated interactions between enzymes and structures all of which have to be perfect for any of the others to make sense and for the whole to function" (my emphasis). Therefore Goddidit. I live in the UK; the shenanigans perpetrated by the American religious never cease to amaze me. Here's Dan Gilbert's thorough report and analysis of Kentucky's Creation Museum (without the distraction of a 300-strong horde of atheist students). "The Creation Museum makes it very clear that Noah took dinosaurs onto the ark. They’re very clear that dinosaurs lived with humans. They’re very clear that they really have no concept whatsoever of science… or reality. They are, however, exquisite craftsmen who make awesome dioramas." Dan's photographs are small on the blog, but you can click on them to see them in hi-res (and well worth the clicking). Tony's at it again, saying that if religions tolerate each other, peace will ensue. But how likely are religions to do such a thing? Not at all likely, given the lessons of history. Why atheists must not tire of responding to the same old arguments they've heard time and time again. Useful advice and encouragement from Laurie T.
A creationist reviews the Times' extracts from Richard Dawkins' new book. God exists because it says so in the Bible. How do we know the Bible is true? It says so in the Bible. But that's circular reasoning! How do we know it's circular reasoning? Because the laws of logic say so. How do we know the laws of logic are true? Because the laws of logic say so. But that's circular reasoning! "It's okay to use circular reasoning to prove the truth of the Bible, because reasoning itself is circular when it says circular reasoning doesn't prove anything." *Why use only one language when you can use three? This is a selfish blog-post on my part. I simply wanted this series of Thunderf00t's videos in a convenient, easily accessible place. I hearby announce the launch of my new podcast, Skepticule, which will be a series of irregular episodes no more than 20 minutes long, addressing areas similar to those addressed here at Evil Burnee, but in audio form. This is all faith and fuzzy feeling - isn't it all terrible, if only we could have more God, everything would be fine and dandy. Sorry Tony, this is more than usually muddle-headed. Anyone (the pope included) who claims that atheists are to blame for global warming is simply not thinking straight. Penn & Teller's half-hour show on the Vatican is indeed hard-hitting, but someone needed to do it. The Catholic League, in the person of Bill Donohue, is veritably frothing at the mouth over it. But he doesn't speak for all Catholics, let alone the Vatican itself, from whom we have yet (2009-09-01) to hear on this subject. Now that we have one (or more) of these camps in the UK, there's a chance that we might soon overtake the US in the number of them, given the relative un/godliness of the two nations. Insightful blog-post on why some people cling to certain beliefs despite ample evidence that those beliefs are incorrect - based on a recent research paper. How to be a political activist . . . or, stop grumbling and attempt to make a difference. Sound advice, in two consecutive posts. Creationists claim that the existence of the Loch Ness monster disproves evolution. Wait, did I miss something? Did Nessie give a press conference? Notice how when opposition to the RU-486 pill on religious grounds fails, the Vatican (or its unofficial spokesperson) switches to saying it's not safe. This is is the same as when the pope claimed that condoms contribute to HIV deaths in Africa. If the original argument doesn't sway people, invent something else that might. Unfortunately (for the Vatican) the reasoning behind the fake argument is just as transparent as the dogma-based argument. The Amazing One adds his (considerable) voice to the godless condemnation of Pope Benny's latest. A discussion of "original sin". Fascinating stuff, but I question its purpose. The fine-tuning argument is actually part of the teleological argument. The way the universe is arranged, from the micro to the macro, is just so. It turns out that everything is just right for intelligent life on Earth. This is so amazingly improbable it must have been done on purpose. Actually no. Look at the size of the universe (in particular, look at the Hubble Ultra Deep Field image). Compared to the size of the universe, life on Earth is an invisible dot on an invisible dot on an invisible dot on an invisible dot. What kind of intelligent creator would make something so mind-bogglingly vast, just so that an infinitesimal part of it could develop intelligent life, while the rest of creation remains – to an almost universal degree – dispassionately deadly? Only an incompetently wasteful one. The reason why the universe appears fine-tuned to us is that we are a product of it. If the universe were "tuned" differently, we would be different (probably utterly and incomprehensibly different). Some people invoke the idea of the multiverse – a possibly infinite number of universes, all slightly different, existing in parallel, and unable to communicate with each other in any way. This hypothesis may be useful as a thought-experiment, but it's unfalsifiable, so of little practical utility. The idea is that there are so many of these parallel universes that all combinations of the values of physical constants will exist, somewhere, however improbable. We just happen to be living in one that contains at least one planet suitable for the evolution of intelligent life. I have to admit that when a Christian evangelist begins a sentence with "The Bible tells us..." I tend to tune out, because inevitably the Bible is being quoted as a source of incontrovertible truth, and personally I've seen no compelling evidence for this belief. Writers like to quote other writers. Someone once complained that they really didn't see what was so great about Shakespeare, because all he had done was take a stack of famous quotations and string them together. We quote other people when when we think they have a unique way of saying something, or when the quote seems particularly apt. So why reinvent the wheel? The shirts, which were designed to promote the band's fall program, are light gray and feature an image of a monkey progressing through stages and eventually emerging as a man. Each figure holds a brass instrument. 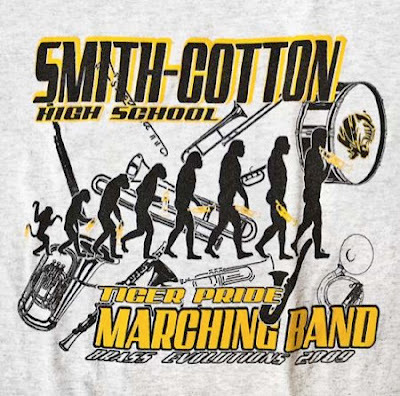 Several instruments decorate the background and the words “Smith-Cotton High School Tiger Pride Marching Band” and “Brass Evolutions 2009” are emblazoned above and below the image. What surprised me about this affair is the assumption by certain people that the mention of "evolution" is somehow a religious issue.